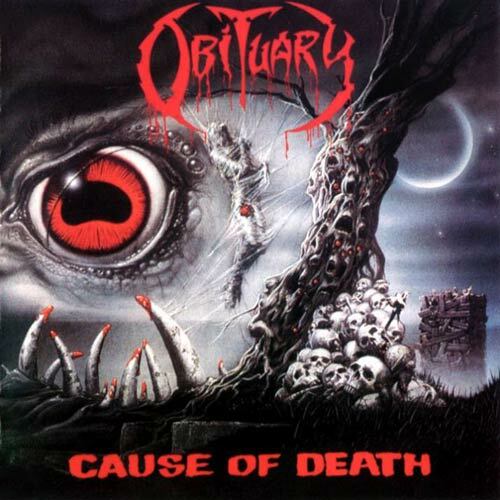 The Floridan scene had plenty of infamous bands, and Obituary was one of the most successful ones. Before they stucked in a state of groovy, mid speed, retiredly bumping death metal, their early and fresh period impressed the whole metal scene. They experimented since the mid '80s already as Executioner with some very heavy music, that includes the heaviness of doom metal, inspired mainly by Celtic Frost. Fast hammering was never usual in their music, but "Slowly We Rot" and "Cause of Death" are likable exceptions, where their common comfy groovy themes were often interrupted. That larger diversity, catchier themes and extremely brutal sounding made "Cause of Death" even more impressing than their debut album was. And of course John Tardy's effective growling and screaming which sounded like from beyond the grave. The early Obituary songs don't even had lyrics, most vocals that could be heard are only John Tardy's improvisations, it was only his style to growl something that could fit and sound good to the music which was always in focus. Anyway, this improvisative, feeling-based album is and important classic of the genre.